This page allows you to find directions, post a comment, read reviews, and check rates at the Loft Hotel. Rates: Low season from $99. High season from $169. The Loft Hotel is an all-suite, boutique hotel. Recently renovated and featuring truly distinctive European styling, it is an upscale yet affordable address offering guests their choice of 21 junior suites. Infused with a genteel warmth, it is the ultimate intimate oasis. Once inside the serene garden, guests can relax and enjoy the lush tropical landscaping and beautiful teak furniture. • The Loft accepts pets for an additional charge of $25 per stay. Click HERE for Loft Lodging Information. • The Loft is on the Left (West) side of the street. 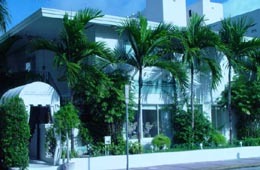 The Loft is located at 952 Collins Ave., Miami Beach, FL 33139. Use our Miami hotel map to find the exact location. Loft Hotel "Worst hotel ever!" The loft was horrible! While I was very pleased with the room when I first got there, things went down hill quickly. I arrived one morningt o find my bags open with the cleanng lady looking in my bag. Just when I thought things couldnt get worse, later on in the night when I went out, when I returned, my room was robbed!!! I banged on the managers door at 2am to tell him and he said-"Oh yeah"!!! I was devastated at first to find my room robbed but then his expression told me that this was an inside job. I am a photographer and all my equipment was stolen, over $2,000. The hotel did nothing to help me recoup. This has happened before at this hotel. Loft Hotel "Loved the Loft"
As we walked through the Small Iron gate at the Loft, it was as if we had taken a step into a little bit of Europe. Truly enchanting. A pretty place without all of the pomp and circumstance of the larger hotels. A wonderful place to take a nap after a long afternoon shopping and eating on the strip, we were tucked away safely to revive ourselves before we were out for a Miami night. A pleasure to stay. I love my man for choosing such a quaint,yet elegant place. Thank You Loft!!! Loft Hotel "Wish it was my loft"
Stayed here for a friend's wedding.. All of us.. and we loved it!!!! Rooms are clean and very spacious! The only thing that we would say it not great is front desk closed later at night and if you are out late and then need something.. you are not in luck! Otherwise...great vacation! Loft Hotel in Miami Beach. Miami hotel reservations.